I am CRAZY about mermaids. Not my-house-is-decorated-only-in-mermaids crazy but like I’ve-only-wanted-to-be-one-my-entire-life crazy. You can blame my mom for letting me watch The Little Mermaid too many times when I was little. I guess that’s why I freaked a little when I found out the local Renaissance Faire was having a Pirate Invasion Day. Normally that’s when all the ladies break out the push-up bras and become pirate wenches but I saw a chance to make my dreams come true. A mermaid at last! To begin I have to show you the original concept. I’m telling you – I go all out with this stuff. It’s weird because while I go all out when it comes to dreaming up costumes I don’t go all out when it comes to making them. I can barely sew and after I finish making one it doesn’t stick around long because I’ll soon cannibalize it to make something else. Anyways, here’s my initial idea for the costume. That criss cross thingee was supposed to be a fish net shawl (how awesome would that look?!) but I couldn’t find a fish net. Otherwise the finished costume turned out very much like what I had in my head. Isn’t it nice when that happens? From the start I knew I HAD to have some kind of head piece. If I had my long hair back I would have gone with a full blown crown or wreath but that would just smoosh my new short hair so instead I opted for a seashell bow clip. The glass bead in the center of the bow matches the ones on my halter because everybody knows it’s a disgrace for a mermaid to have mismatching straps and head gear. If this seashell bow looks familiar it might be because you saw my tutorial on a similar one last summer! You can find out how to make it here. While googling mermaid costumes for inspiration I saw some stunning make-up jobs with scales, false eye lashes, and rhinestones. Make-up is by no means my area of expertise so I didn’t try anything on that level but I did think these sparkly dots were fun. Watch out though, that blue glitter gets everywhere. For the top I originally planned to get a bra and go crazy decorating it. However, realizing I was the only one in our friend group who wouldn’t be wearing jeans and a t-shirt made me take the more conservative route. I used a regular halter bra for support but decorated a bandeau and wore that on top. The straps are just folded gauze strips with beads sewn on for decoration. Lovely! It took me awhile to figure out the tail since I knew I needed to be able to walk at the fair. I found lots of interesting styles like this which were super cute but I didn’t have that much time to sew. When I saw this and this though I got excited. I had no idea what fabric I would be using or even what color I wanted. Green was the obvious choice but since I was working with a time constraint (and trying to keep things affordable) my options were limited. Thankfully, a few months ago one of my aunts gave me an old dress of hers. It was a pastel purple floor length gown with spaghetti straps and a beaded gauze overlay – think early 2000’s. Not my style but I took it because you should never turn down free clothes! Good thing I did because it ended up giving me 75% of the outfit. I cut off the bodice which left me a long flowing skirt with a gauze overlay. I cut the spaghetti straps off the bodice and they became my head band and the purple decorative cord on the bandeau top. I cut the gauze overlay off the skirt and used it to make the hip wrap and strap for the bandeau. With the gauze removed I was left with a beautiful long silky purple skirt…perfect mermaid material! 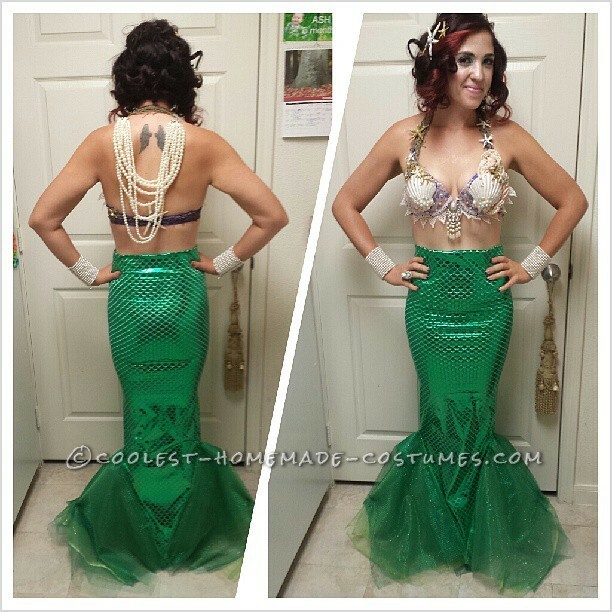 I sewed some simple folds in the back of the skirt to change the shape from A-line to mermaid. 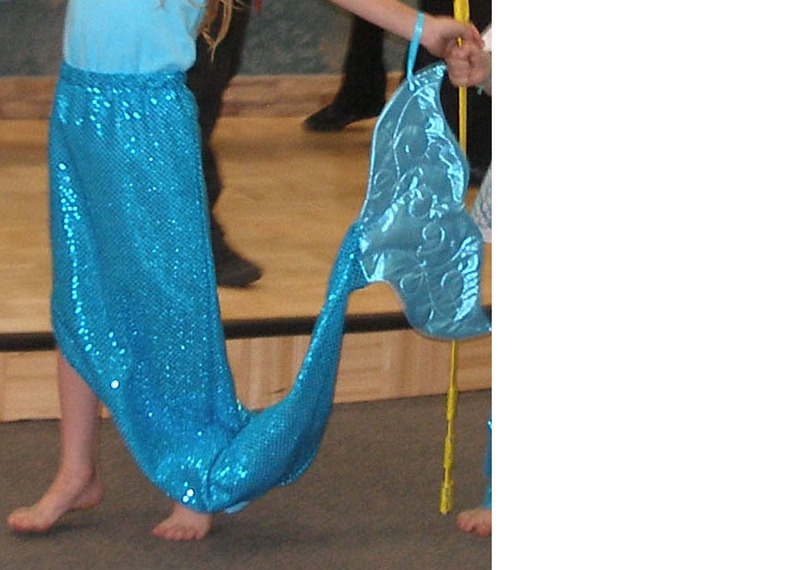 The little bit of crinoline at the bottom could not have been placed more perfectly though I’m sure the designer wasn’t planning for it to one day become a mermaid tail. It flared out just the way I hoped and boom! Fins. There were some very specific ideas floating around in my head about jewelry but when whipping together costumes like this it’s hard to know exactly what will look good until the costume is 100% done. You kind of just figure it out as you go so I gathered all my beachy looking craft supplies and took it from there. The pearl necklace ended up as a hip wrap, the blue rocks didn’t get used at all, the pink glass got used on everything, the green beads didn’t get used at all, and you already know about the shells. 10 points if you noticed I paid homage to Ariel with purple, green, and red colors. 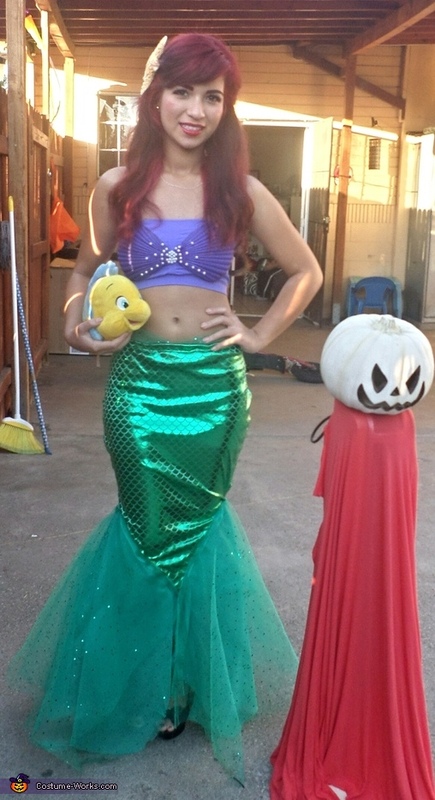 It just feels kind of disrespectful to make a mermaid costume without giving her a shout-out, you know? That’s it! Believe it or not the only thing I had to go out and buy for this entire costume was $4.97 worth of seashells. Literally everything else was free or something I already on hand. Just goes to show that you don’t need to spend tons of money or buy something pre-made in order to have a cute costume. I think you did an amazing job on this costume and the fact that it was so inexpensive is wonderful too! I always love The Little Mermaid and her color scheme so I heartily approve of your choice of color. You look so so cute! This is too cute! Can I borrow it for Halloween? I too am obsessed with Ariel!